The 1970 World Series of Poker was hosted at Binion’s Horseshoe Casino, and it was quite different from the WSOP we know today. Benny Binion invited the very best poker players to come to Las Vegas and determine the world champion through open competition. Binion hoped to improve upon the Texas Gamblers Reunion he had attended the year before in Reno, Nevada, and he also hoped to once again capture the public’s imagination with poker the way he had 19 years earlier during the heads-up match between Johnny Moss and Nick “The Greek” Dandalos. 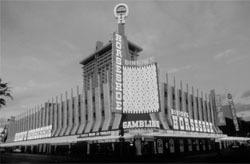 The Horseshoe did not have a poker room when Binion’s decided to host its first tournament, so one was erected for the event, despite its intrusion on valuable gaming floor real estate. The first WSOP lineup included legends Moss, Doyle Brunson, “Amarillo Slim” Preston, “Puggy” Pearson, “Sailor” Roberts, Jack “Treetop” Straus, Bill Boyd, “Titanic” Thompson, Jimmy Casella, Crandell Addington, and a handful of other players. They played a number of card games over the next three days, including five-card stud and draw, seven-card stud, seven-card stud hi-lo, deuce-to-seven and ace-to-five lowball, razz, and Texas hold’em. Players rotated in and out of the mixed cash game when they became too tired to continue, and it was up to the players themselves to choose which games they wanted to contest at all hours of the day (and night). At the end of the evening, Jack Binion asked the players to vote for best all-around player. According to legend, every player voted for himself the first time around. Binion then asked them to vote a second time, for the player they thought was second to their own superior skills. It was after this vote that Moss was proclaimed world champion, and the winner of the inaugural WSOP. No cash prizes were awarded to the winner (Moss was awarded a silver-cup trophy), but a lot of money changed hands over the three days of the tournament, given that the players used their own money in competition.